Our life finds itself between past and future in the ‘now’ but it is impossible to define this ‘now’. Everything we experience in life is made up of an apparently indefinite number of ‘nows’ and, to say the least, it is remarkable that the building blocks that lead us from birth to death are slippery. According to the special relativity theory of Einstein it is even so that time can accelerate and slow down. This because the only constant factor is the speed of light (300,000 km/s) which makes everything else, including time, relative. To increase the unimaginable of our existence even further, it is interesting to determine from which all matter, including the human body, is constructed. Most obvious and in itself also correct answer is molecules and atoms. But then you only have reached the level of bricks and cells. The base consists of Stardust, a collection of extremely small particles (leptons, quarks, bosons), which comes from stars that already dozens of billions of years ago are extinguished. This kind of particles have very different laws (the standard model of particle physics) according to which they exist than Newton’s laws and with the recent discovery of the Higgs particle is a big part of the puzzle solved (where not all scientists are equally happy with it). Nijehaske in Friesland (NL). The sun rises, low-hanging mist over the meadows and ripe in the trees. The start of a new day for watch manufacturer Christiaan van der Klaauw Astronomical Watches whose namesake already since 1974 makes high-quality timepieces.Today, Christiaan van der Klaauw are no longer just on his own. 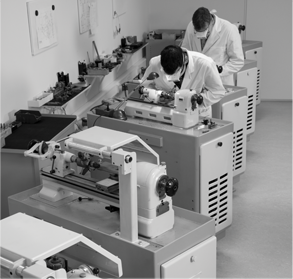 Next to him, there are three partners and at least 3 watchmakers and instrument makers. 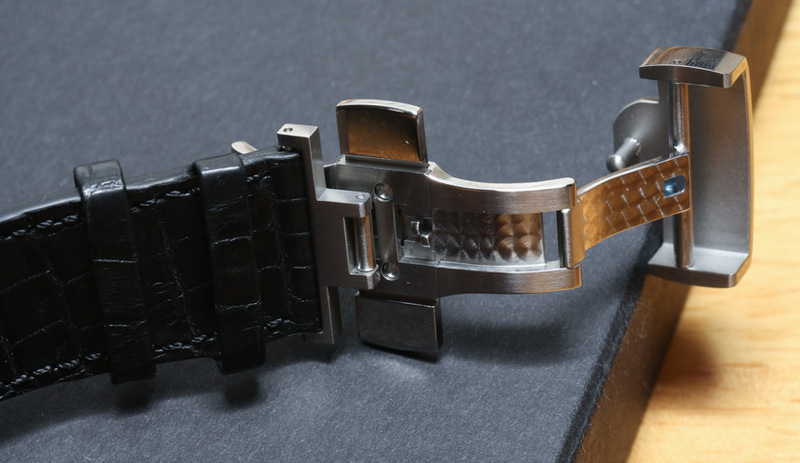 Christiaan van der Klaauw makes about 200 watches per year and has 10 outlets in Netherlands and 10 international. The aim for the future is a production of at least 1000 per year and 50 sales points. As Christiaan van der Klaauw already early in his career was fascinated by time and space, it is worthwhile to us first to delve into the history of astronomy. Astronomy is one of the oldest sciences in the world. One of the oldest astronomical structures, dating back to prehistoric times, can be found in England. The way in which the stones of ‘Stonehenge’ are positioned corresponds with the position of the stars. Some astronomers even think that people could predict eclipses of the Sun and the Moon by means of the Stonehenge. In ancient China, Egypt and the Babylonian Empire, people were also involved in the first forms of astronomy, in the form of calendar calculation and astrology. Time and timekeeping have played an important role in ancient China, as is evidenced by the waterclock, which was invented more than 2500 years ago in China, and was used for astronomic and astrological ends. In the Egyptian civilisation, we see many references to celestial bodies. The pyramids of Gizeh represent part of the constellation of Orion according to some prominent scientists. In Greek Antiquity, many important constellations were described, and many theories were developed. They distinguished, for example, seven moving celestial bodies: Moon, Mars, Mercury, Jupiter, Venus, Saturn and the Sun. To this we owe our seven-day week. Greek astronomers who made an important contribution to science were, amongst others: Thales of Miletus, who was the first to predict an eclipse of the Sun. The famous Pythagoras, who not only produced his world-famous theorem, but also, like Aristotle, argued that the Earth was spherical. 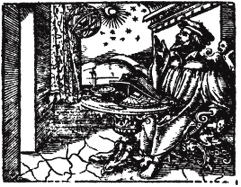 Ptolemy, deviser of the geocentric system, which assumes that the Earth is the centre of the universe, and the Sun and other planets revolve around the Earth. In the period that followed, Arabs and Persians made an important contribution to the development of astronomy. In particular in the period from the 8th to the 13th century, many theories were formed and described in the Middle East. The scientist Al Battani, for instance, explained the theoretical foundations of the Astrolabe in his writings. In Baghdad there was the so-called House of Wisdom. Various astronomers, such as Al-Chwarizmi and Thabit ibn Qurra worked from this place, and their discoveries meant an enrichment of astronomy. In the 16th century, Copernicus tried to get rid of the inaccuracies of the geocentric system, and developed a new theory. He advanced the thesis that not the Earth, but the Sun was in the centre, and that the planets, amongst which the Earth, revolved around the Sun. This theory is known as heliocentrism. 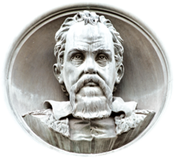 Two well-known astronomers who supported Copernicus’ theory were Galileo Galilei and Johannes Kepler. Galileo Galilei mainly owes his fame to being one of the first to use a telescope for studying the universe. An interesting detail is that the telescope was a Dutch invention. A century after this, Isaac Newton was the first astronomer to link mathematical and physical models to astronomy. The famous Dutch mathematician, physician and astronomer Christiaan Huygens was a contemporary of Isaac Newton. This source of inspiration to Christiaan van der Klaauw was an all-round scientist with countless discoveries (e.g. Orion nebula and the true nature of the ring of Saturn) and inventions to his name. He became mainly known for his knowledge in the field of astronomy and time observation. Astronomy and orientation at sea required accurate time measurements. Huygens applied himself to this problem and developed instruments with which time could be measured very accurately. In 1656 he invented the pendulum clock, which was patented on 16 June 1657. In his work ‘Horologium Oscillatorium sive de motu pendulorum’ (1673) he described the theory of movement of a pendulum. Approximately 100 years later, the Dutch-Frisian astronomer Eise Eisinga continued the work of Huygens. Eise Eisinga was of humble origin and highly talented. At the age of 15, he published a mathematics book of over 600 pages. When he was 17, he published a book on the basics of astronomy. He reached his legendary status when a conjunction of the Moon and the planets Mercury, Venus, Mars and Jupiter was to occur. A Dutch-Frisian dignitary, whose opinion was held in high esteem, predicted that these celestial bodies would collide with one another on 8 May 1774. As a result, the Earth would be thrown out of its orbit and would burn in the Sun. This prediction caused an enormous panic in Friesland. In order to demonstrate that there was no reason for panic, Eisinga built a scale model of our solar system in his living-room. 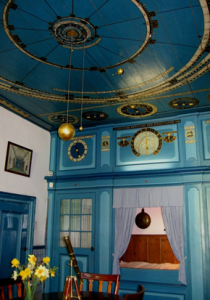 A time-piece built in the attic regulated the orbital times of the planets known at the time. In this way, Eisinga could prove that the celestial bodies revolve around the Sun according to fixed patterns. To this very day, the Eise Eisinga Planetarium is still intact, which makes it the oldest working planetarium in the world. The Eise Eisinga Planetarium has meanwhile been transformed into a museum where various historical astronomical instruments are on display. In 1997 the Eise Eisinga Planetarium was fully restored. The restoration was supervised by the prominent astronomer Hans Noordmans. Hans Noordmans is also involved in the development of Christiaan van der Klaauw Astronomical Watches in an advising role. In recognition of what he has meant to (Frisian) astronomy, Christiaan van der Klaauw Astronomical Watches will soon present the ‘Astrolabium Hans Noordmans’. One of the eye-catchers of the museum is a clock made by Christiaan van der Klaauw. With this clock and also the smallest planetarium in the world in one of his watches, Christiaan van der Klaauw carries on the tradition of the Frisian astronomy. When visiting the work sites and workshops of Christiaan van der Klaauw you instantly notice serenity and passion for timepieces of the employees. 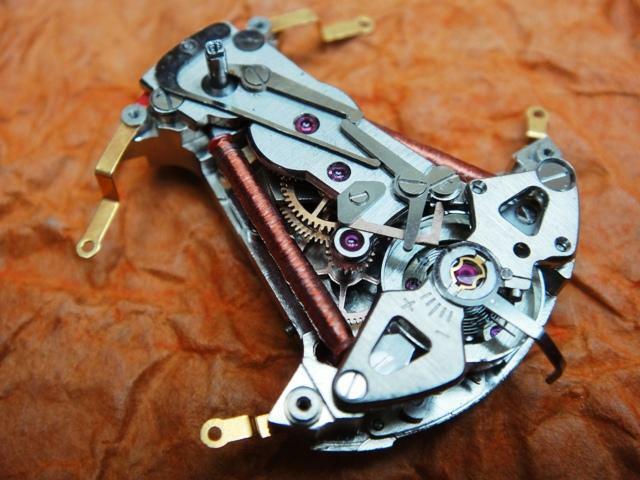 Three watchmakers build each watch by hand and use the best materials and methods to do this. The basis for the watches are formed by movements of high quality Swiss manufacturers. These are adapted and modified to meet the high demands Christiaan van der Klaauw presents to his watches. A part of the parts is purchased in Switzerland and a part is itself manufactured. Making meticulous components such as cogs, is manual work because there are no machines that have the accuracy a human hand has. In contrast, the high-tech computers with CAD/CAM programs that allow designs to be made in 3D and with which the information can be captured to steer the different machines. A good example to illustrate what Christiaan van der Klaauw watches stand for is the Real Moon 1980. The watch is available in steel, rose gold and white gold. There is also a limited edition of 8 pieces in Platinum. Most striking is the Moon, a ball with a diameter of 5 mm, which is located on ‘ 6 ‘ h. On ‘ 12 ‘ hour one can see the logo of Christiaan van der Klaauw, the 12-armed Sun. On the positions ‘ 3 ‘ and ‘ 9 ‘ two small dials catch your attention. The Moon gives the current moon phase by rotating. The Moon rotates in 29 days, 12 hours and 44 minutes (29, 53058885 days) around the Earth. The complication in the Real Moon 1980 has a deviation of only 1 day in 5400 years. The logo on the ‘ 12 ‘ position gives the height of the Sun in relation to the horizon. The axis of the rotating earth is slanted in her position to the sun. This principle is called declination and means that in places where the Earth is tilted toward the Sun, there is summer. Tilted away from the sun there is winter. The 3 hour position is reserved for the Eclipse pointer. If the Eclipse pointer is within the indication stripes somewhere on Earth there is a solar or Lunar Eclipse. Finally the 9 hour position. There can be read off the month and date. The dial is not the only thing that is worth looking at in Christiaan van der Klaauw watch. Through the sapphire glass back you can admire the beautifully hand-engraved rotor; This work of art is created by Jochen Benzinger. Christiaan van der Klaauw astronomical watches are dazzlingly beautiful and all have an astronomical basis. 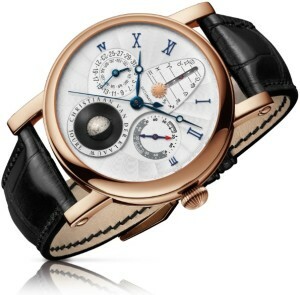 With such a watch you really have something special and rare to your wrist. It is well worth looking at the whole collection Christiaan van der Klaauw Astronomical Watches and endulge yourself in the product of pure watch lovers. The Clerc Hydroscaph H1 is a diving instrument built to uncompromising standards of fine workmanship and endowed with an impressive array of assets, including an exclusive COSC- certified chronometer movement offering the ultimate pledge of precision and reliability; a powerful and innovative design; along with tried and tested security thanks to 500-metre water resistance coupled with a patented construction designed to prevent any accidental deregulation of the bezel. These highly functional technical features are expressed through a range of aesthetic variations forming distinctive and individualised compositions. A first glance at the Hydroscaph H1, the brand’s latest technical, powerful new model brimming with the identity features that have forged the success of Clerc since 1874, is enough to quicken the pulse of thrill-seekers looking for a watch to match their sporting temperament. 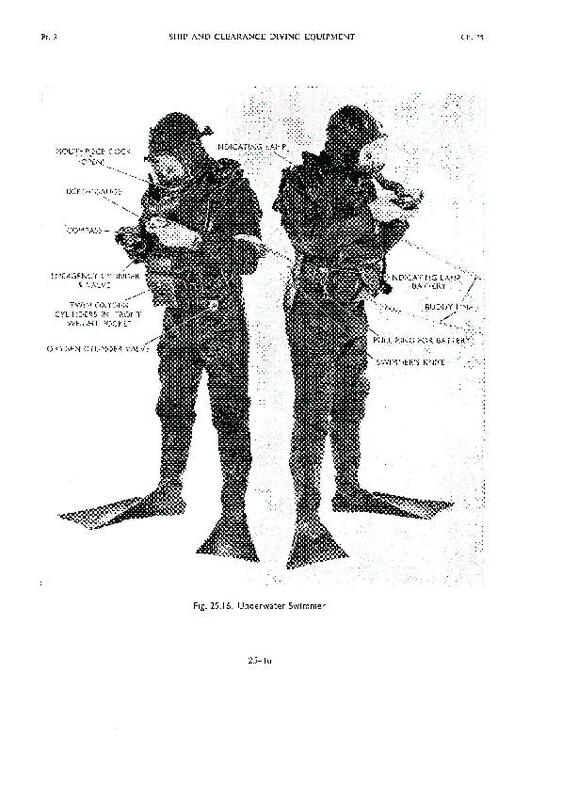 While the high-tech construction of this luxury diving model immediately catches and holds the gaze, it is above all a formidable exploring machine. 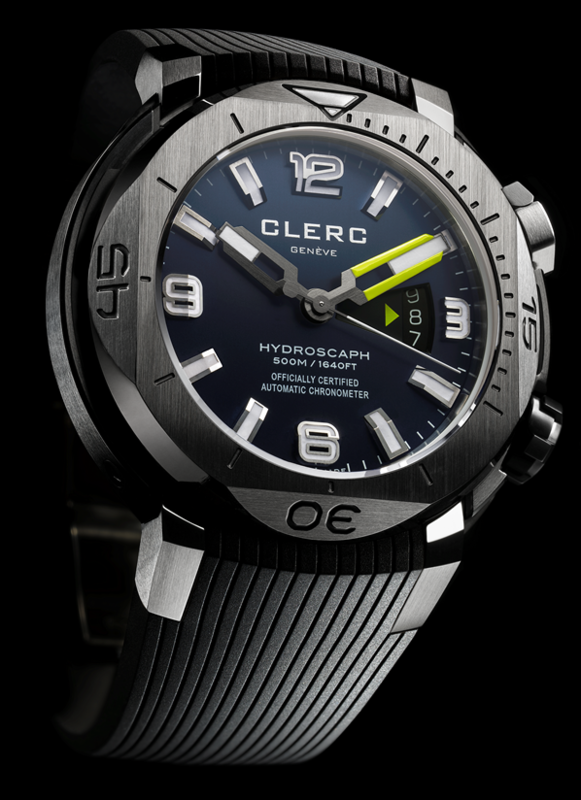 Capable of plunging to depths of 500 metres, it houses an exclusive self-winding Clerc movement: Calibre C609. For Gérald Clerc, representing the fourth generation of the famous watchmaking family, this movement is a return to roots. Like his first collection created in 1998, Calibre C609 emerged victorious from its immersion into the merciless set of tests conducted by the Swiss Official Chronometer Testing Institute and can thus rightly claim to be a COSC-certified chronometer – the most prestigious pledge of precision and reliability. 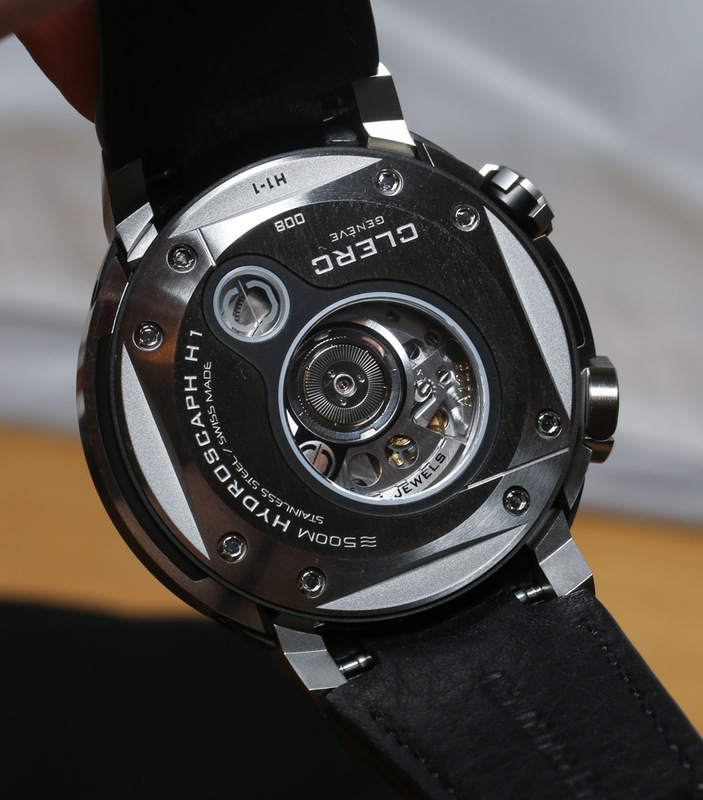 Beating at a high frequency of 4 Hz, meaning 28,800 vibrations per hour, the C609 movement is simple in terms of its functions – hours, minutes, seconds, date – backed by a 42- hour power reserve, while featuring a highly demanding level of finishing including bridges adorned with Côtes de Genève and blued screws. These resolutely fine watchmaking finishes, along with the openworked oscillating weight, have become a signature of Clerc movements and are visible through the exhibition back. Comfort is also part of the package, with mobile lugs perfectly moulding the curve of the wrist, even when worn over a neoprene diving suit. For the Geneva-based watchmaker, creative passion is not confined to the sophistication of an exceptional mechanism, but also makes no concessions when it comes to design and materials. 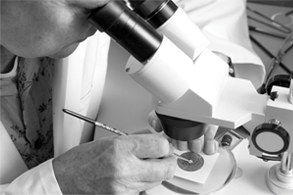 The extremely complex case stems from a highly technical architectural approach. Developed in close cooperation with a team of professionals well acquainted with the specific requirements of the underwater world, it comprises 81 parts and meets a three-fold demand: exceptional aesthetic appeal, innovative construction and useful functions. The case middle is flanked by lateral reinforcements ensuring water resistance to 500 metres, while the powerful octagonal rotating bezel forcefully imposes the iconic signature of the Hydroscaph collection. Because safety reigns supreme when it comes to braving the depths, the dedicated crown at 2 o’clock serving to pivot the bezel requires prior deployment of a built-in retractable flap. Returning the flap to its initial position securely locks the bezel, thus avoiding any risk of accidental deregulation when diving. Beneath its apparent simplicity, the dial of the Clerc Hydroscaph H1 reveals an undeniable aesthetic and technical appeal. The impact and the optimal legibility of the display combined with a complex construction further accentuate the strength of this model. The individually machined three-dimensional numerals and hour-markers proclaim a boldly assertive character. When viewed from the front, they appear slightly trapeze-shaped, while ensuring maximum readability from all angles. Like them, the hands also display a post-industrial look and are coated with Superluminova for perfect read-off even in the darkest abyss. 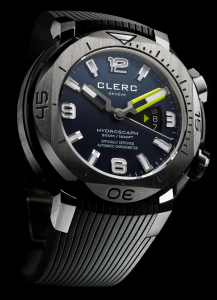 The inimitably stylish Clerc Hydroscaph H1 offers a range of interpretations designed to suit/match all manner of personal preferences. 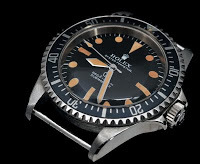 The case itself is interpreted in high-density steel, with or without a black DLC coating of the bezel, case middle – or indeed the entire case. The dial comes in a choice of blue, black or grey, while the seconds hand and the triangular date marker at 3 o’clock spice things up with touches of blue, red khaki or fluorescent yellow. 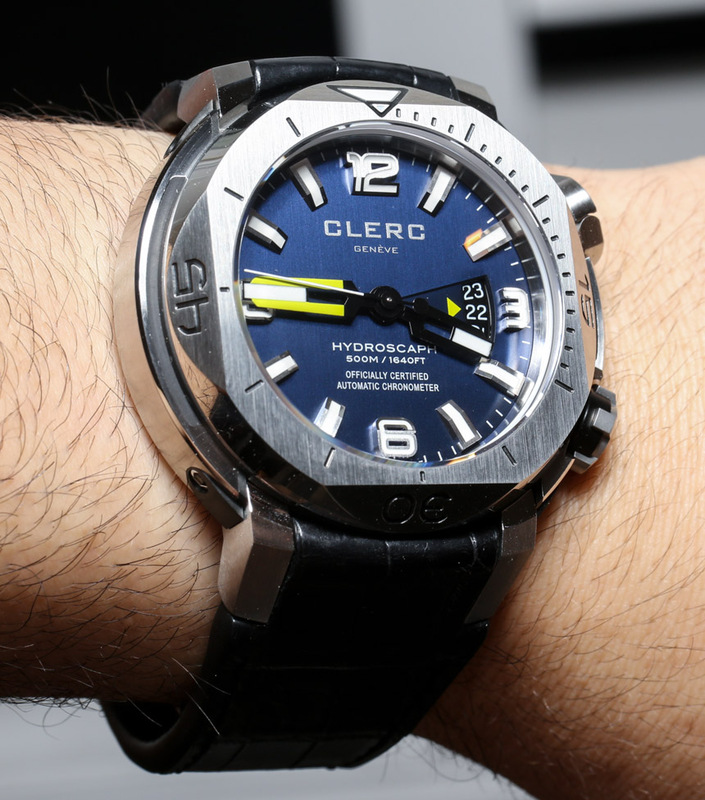 Available in black, blue, red or khaki vulcanised rubber, as well as black, navy blue or chestnut brown Louisiana alligator leather versions, the strap with its folding clasp sets the perfect finishing touch to the Clerc Hydroscaph H1. A high-tech expression of contemporary horology, the new Hydroscaph H1 once again expresses the uncompromising excellence that has been the inimitable signature of Clerc since 1874. 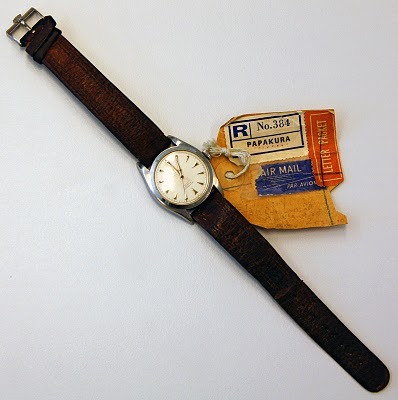 At the end of the 1950s the American firm Hamilton won an international battle by being the first company that produced a wrist watch that got it’s energy from a battery. At the same time the French firm Lip, the American Elgin and the German Epperlein were working on this development. 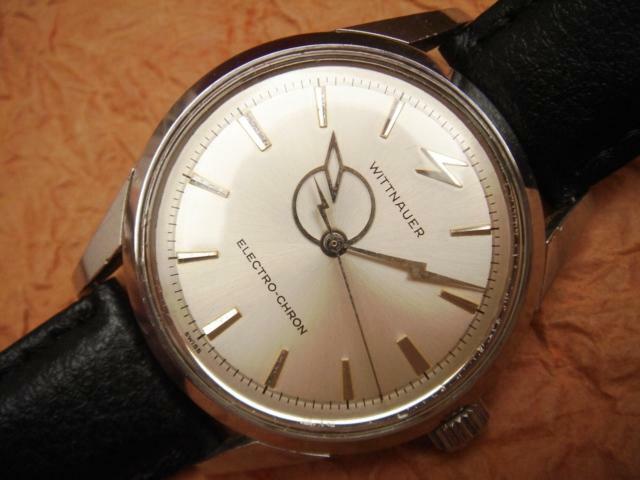 How did the development of the very first electrical wrist watches go? On the 3rd of January 1957 a new chapter in the history of time keeping started: the first new invention for the wrist watch, since the invention of the automatic watch by John Harwood, was the Hamilton Electric 500. Although still having a balance it was no longer driven by a spring but by a coil that moved in a magnetic field. 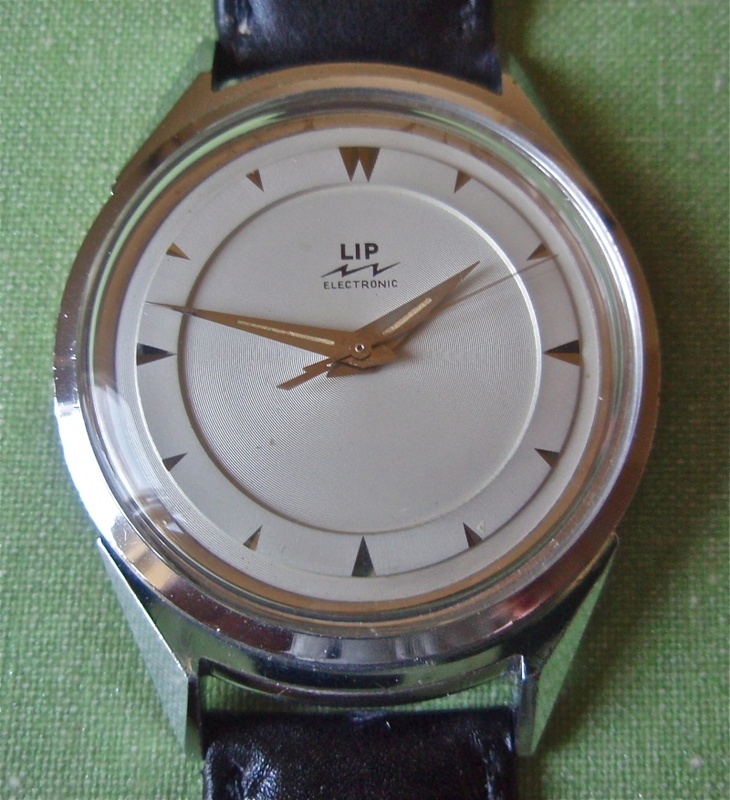 Since the beginning of the 1950s the French firm Lip, the American Hamilton and the German Epperlein from Pforzheim had begun with the development of an electric wrist watch. The Swiss watch companies on the other side expressed an absolute non-interest in these watches. They kept trusting the unlimited possibilities of the mechanical watch. It was not before the 1980s that they tried to catch up with the introduction of the Swatch. 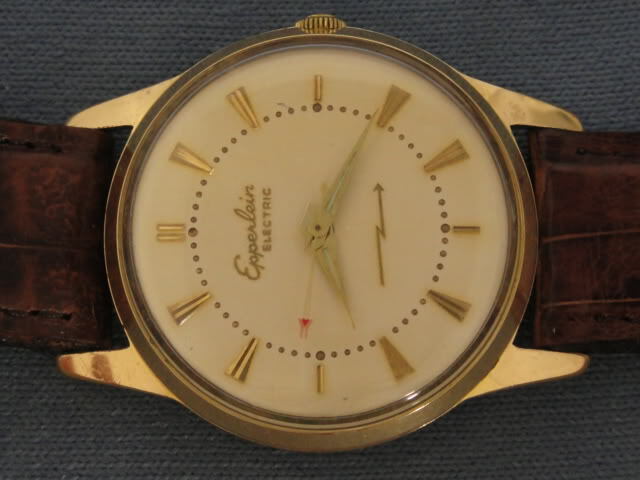 Under the leadership of the head of the research department, G. Luckey, the Hamilton Watch Company in Lancaster, Pennsylvania (USA) started directly after WOII with the development of an electric wrist watch. 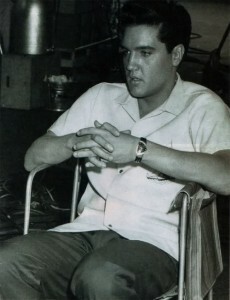 In 1952 the first prototypes were ready and serial production started at the end of 1956. On the 3rd of January 1957 the first two legendary models ‘Ventura’ and ‘Van Horn’ were shown to the press and in April 1957 they became for sale. The ‘Watch of the Future’ was ready for the market. Their revolutionary cases are designed by Richard Arbib, known for his car designs for General Motors and the American Motors Corporation. With the introduction of these models classic made watches became less and less important and the rise of the design watch started. 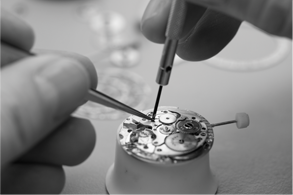 Nowadays nearly all watches are designed by good designers or artists, the factory teams are replaced by freelance designers. After the very successful Ventura tens of interesting and beautifully styled models followed which all had the caliber 500. Pic. 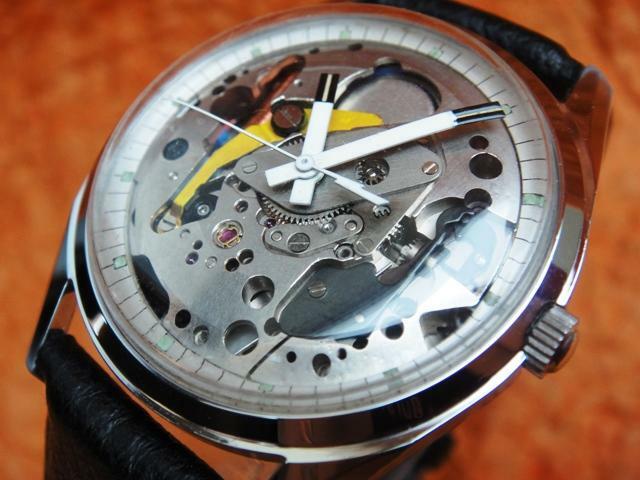 : The Hamilton 500 has, like all mechanical wrist watches, a back and forward going balance with torsion spring. But in this case there is a coil on the balance and on the platine there are two permanent magnets. 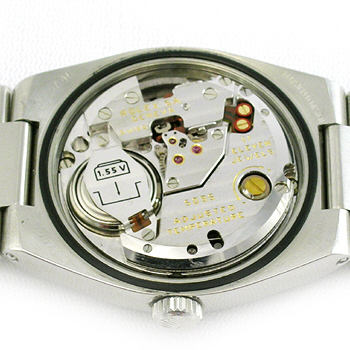 The Hamilton 500 has, like all mechanical wrist watches, a back and forward going balance with torsion spring. But in this case there is a coil on the balance and on the platine there are two permanent magnets. A small pawl on the axis of the balance pushes once per rotation against a contact spring that closes an electrical circuit causing, for a very short time, electricity to go through the coil on the balance. The coil then becomes magnetic and will be pushed away by the two magnets on the platine. The balance gets an impulse from the magnets by every rotation and a short time later an impulse from the balance spring in the opposite direction. This keeps the balance in motion and drives the cogs that in the end make the hands moving. The biggest problem with these watches is the extremely accurate setting of the contacts and the branding and corrosion of these. This can be compared to the branding of the spark plugs in a car. These contacts are being opened and closed 10.000 times per hour. Per year this is about 100 million times. 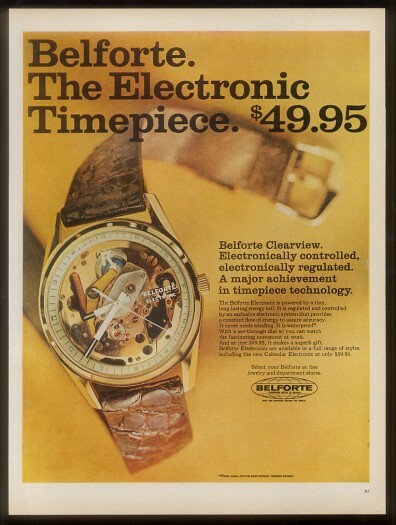 It is clear that this has always been a problem with the first electric watches. The invention of the transistor in 1948 brought the solution. This device can put power on and off without the need of contacts. The first time a transistor was used in a wrist watch was in the Bulova Accutron which also had a tuning-fork instead of a balance. With these applications the accuracy improved enormously. 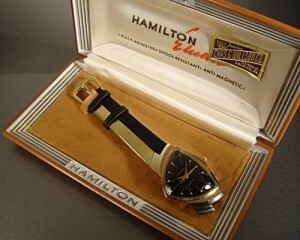 In 1961 Hamilton introduced the much more reliable caliber 505. It had a totally renewed contact system that didn’t need adjustments from outside. Total production of the calibers 500 and 505 is about 500,000 before production ended in 1969. In 1974 the Hamilton Watch Company was sold to the firm Aetos Watch, a daughter of the SSIH Company (nowadays called SMH) to which also Omega belonged. 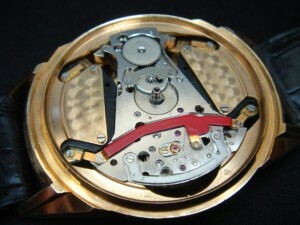 Because of this Omega got his hand on the production techniques for the full-electronic wrist watch, as developed by Hamilton, without any mechanical part, the famous Pulsar with the well known red LED readoff. The development of the first German electrical wrist watch, the Epperlein 100, is in parallel with the American Hamilton 500. Near Pforzheim, in Kaempfelbach-Ersingen the first prototypes were produced round 1953 by Uhrenwerk-Ersingen, in short UWERSI. The owner was Helmut Epperlein, born in Chemnitz in 1911. 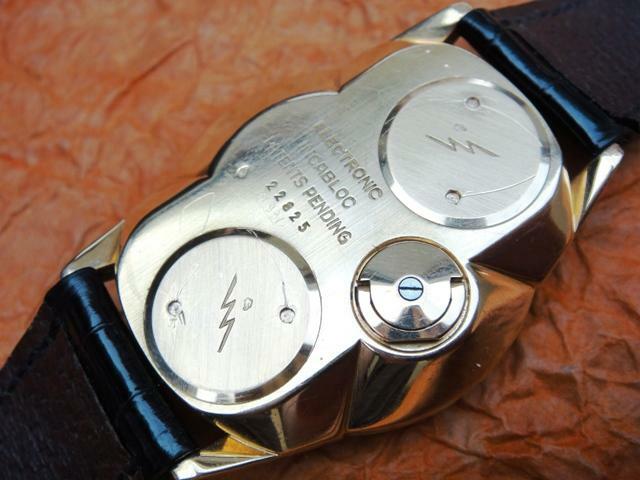 The resemblance with the Hamilton 500 is striking, both have two contact springs and a coil on the balance but also the same problems with the contacts. The development costs were so high that Epperlein was forced to sell many patents to Hamilton. 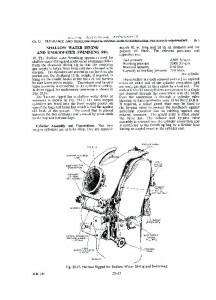 These patents which are owned by Hamilton contain the name of the inventor: Helmut Epperlein or one of his associates. Another part of the deal was that Epperlein could use these patents in watches of their own. These were used to finally come up with a watch of their own: the 1959 Epperlein 100. The success of the Hamilton 500 and the Lip R27 were so overwhelming that the Epperlein 100 didn’t stand a chance. The production was ended a couple of years later. In total only 5,000 pieces were manufactured, of which a part, due to technical problems, was destroyed later. It is a very rare watch. Shortly before Christmas 1958 the Lip firm first offered the R27 to the public. This made it the first watch of this type in Europe and second in the world. The Lip watch was difficult to repair and pretty expensive. 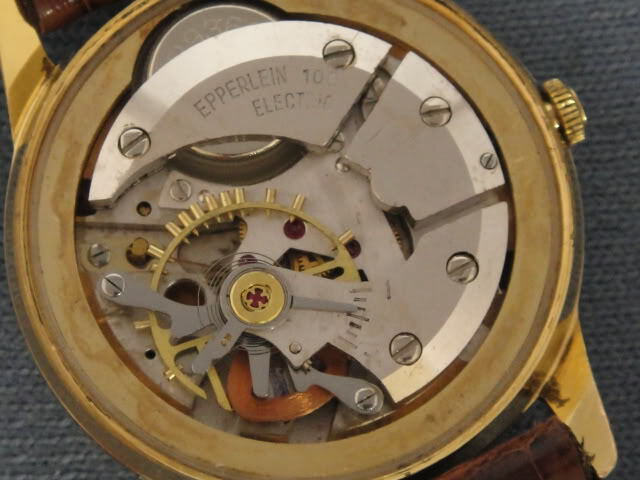 In total there were only 7,000 pieces sold.In contrast to the Hamilton 500 and the Epperlein 100 the Lip R27 had a coil that was fixed on the platine. On the balance their was a piece of soft iron that was attracted to the fixed coil at the right moment. 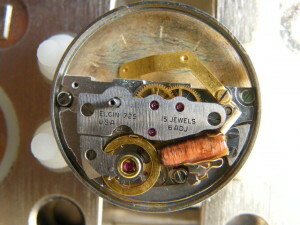 A pawl on the balance determined when the spring contacts closed the electric circuit so that the coil became magnetic. This principle is the opposite as the one seen in the Hamilton 500. 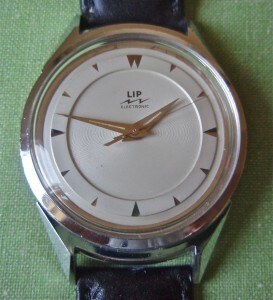 In september 1962 Lip brought out a much improved version: the Lip R 148. 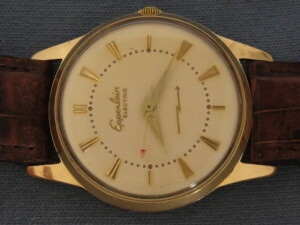 A successful watch that was sold in large numbers, even to the American company Elgin. 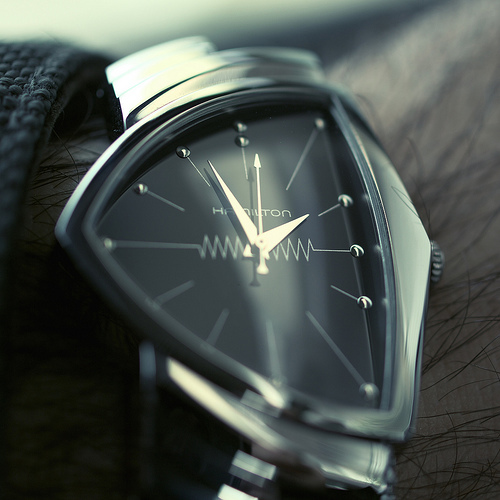 The introduction of the R 148 directly caused the production of the first Swiss electric watch, the 1961 Landeron L4750, to be ended quickly. Too expensive, too late with the development and too late on the market. The American firm Elgin had developed the very small caliber 722 and the somewhat bigger 725 but these were only in the stores in 1962 and turned out to be no success. 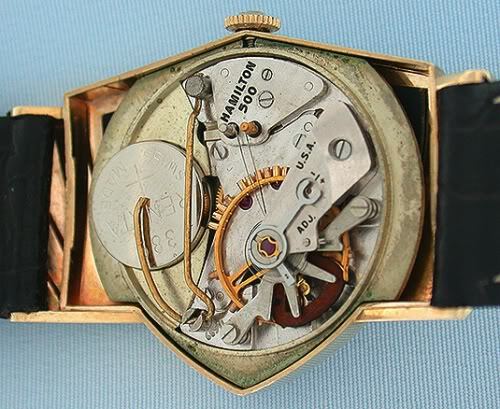 Interesting is the fact that Elgin was the first company that patented a completely electric watch. The development had taken too long and the introduction turned out to be a disaster. The planned cooperation with Lip ended with nothing. Without the calibers of Laco Pforzheim the history of the first electric watches is not complete. 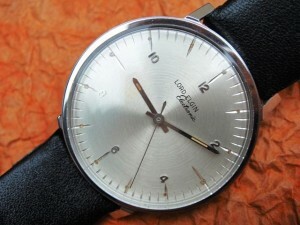 The Laco 860 and movements based on this were the first reliable and sold in large numbers electric watches in Germany. The design looks a lot like the Hamilton 500, with a coil on the balance. In 1959 Lacher & Co (Laco) was taken over by the rich Timex company. In the beginning you typically see both names used randomly. 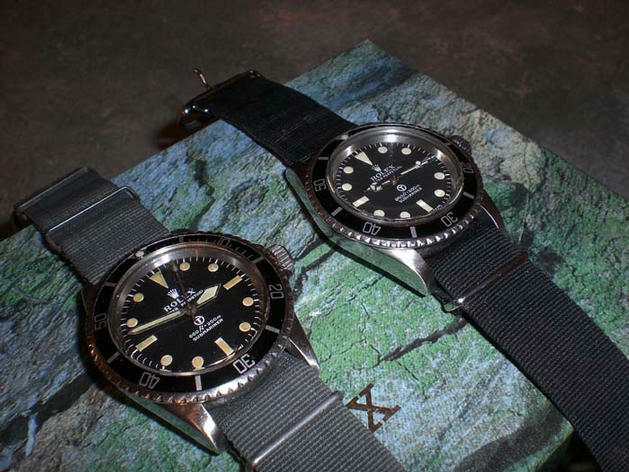 In the seventies Rolex produced two types of Submariners for the Royal Navy, ref 5513 and ref 5517. 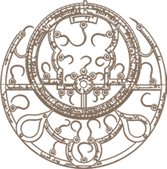 The general assumption is that approximately 1200 samples of these types were produced in total. Between 180 and a few hundred samples are estimated to be still around. Besides, the question is whether they are in an original state and if so, how many (for instance, the hands were occasionally replaced by Omega ones). + Dial: the dial itself is a standard 5513 sample, the encircled big ‘T’ over the depth indications at 6 hr being the most noticeable modification. 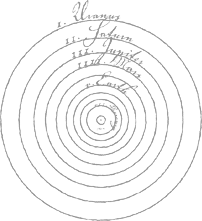 The ‘T’ indicated tritium-labelling. 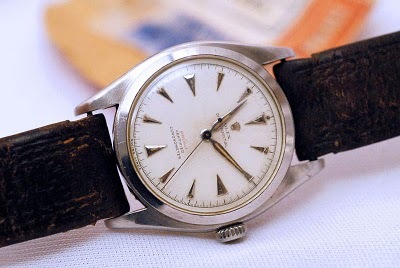 + Hands: the hands are unique for this model and are often called ‘sword’ hands (they strongly resemble the hands of the Omega Seamaster). 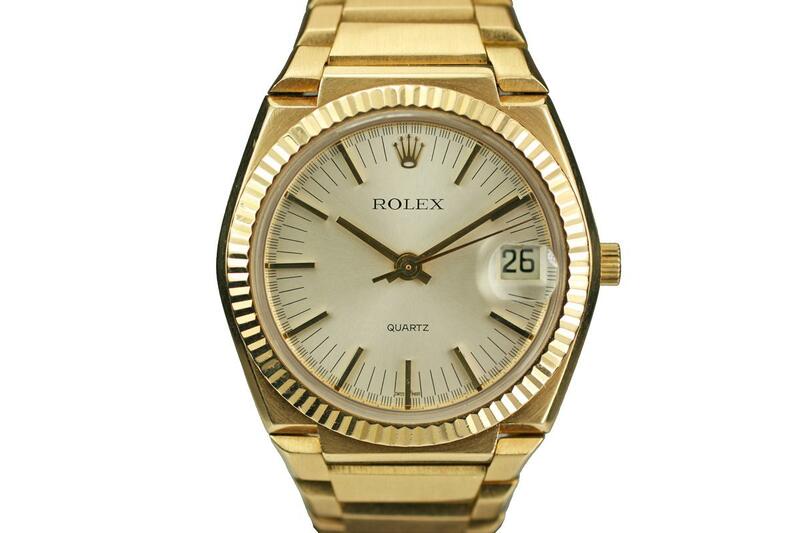 Rolex no longer produces these hands and neither are they in stock any more. Due to their larger surface and the use of tritium the hands are susceptible to flaking or oxidation. 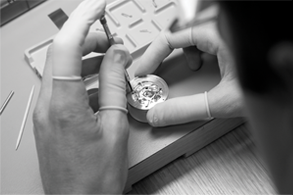 + Frame and insertions: The frame is a standard one, but the insertions in many watches are specifically manufactured with minute markers on every side. This is unique for the military subs. + Watchcase: the case is a standard 5513, but the spring bars for attaching the watchband are replaced by metal bars for the NATO band. 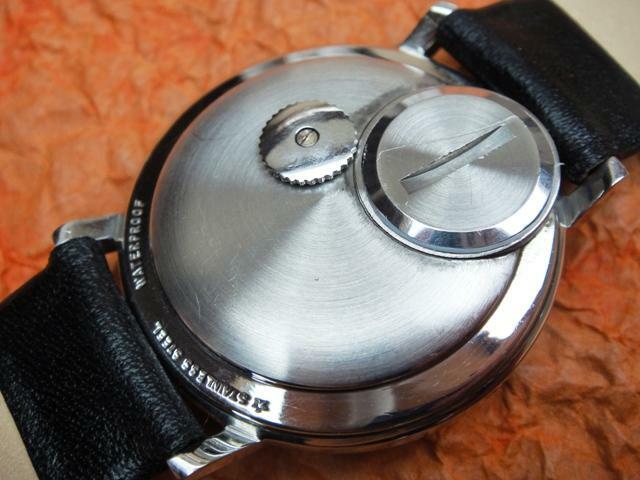 + Caseback: the caseback always contains a MOD part number starting with 0552 or W10, a triangle with a hat on top and an issue number and year below. + 5513: the hands were either of the ‘sword’ type or the ‘mercedes’ type. + 5513: the frame contained either 60-minute insertions or 15-minute insertions. + 5517: only produced with the ‘sword’ hands and the 60-minute insertion frame. 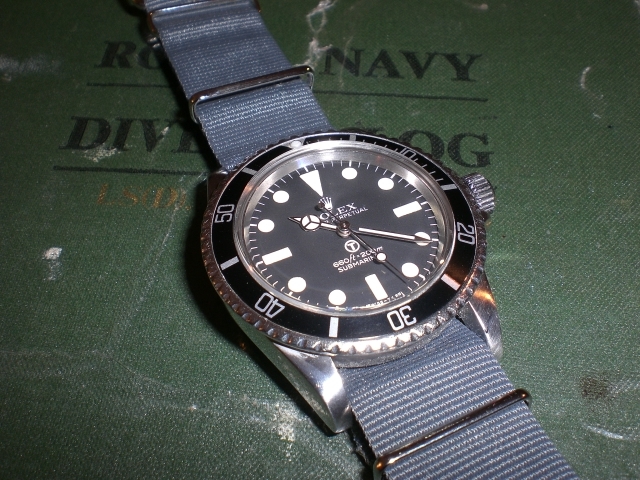 The grey NATO band milsub was part of the standard Royal Navy equipment for clearance divers. The band was attached to the case by solid bars, because the normal system entailed a risk of a pin snapping. 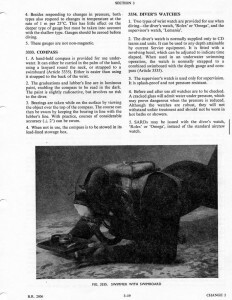 The NATO band was also used for attaching oneself to the diver’s swimming board, a square board containing a depth gauge and a compass. 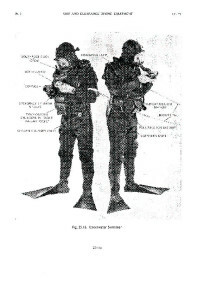 The Navy diver used the board to navigate when approaching hostile vessels to lay limpet mines for instance. 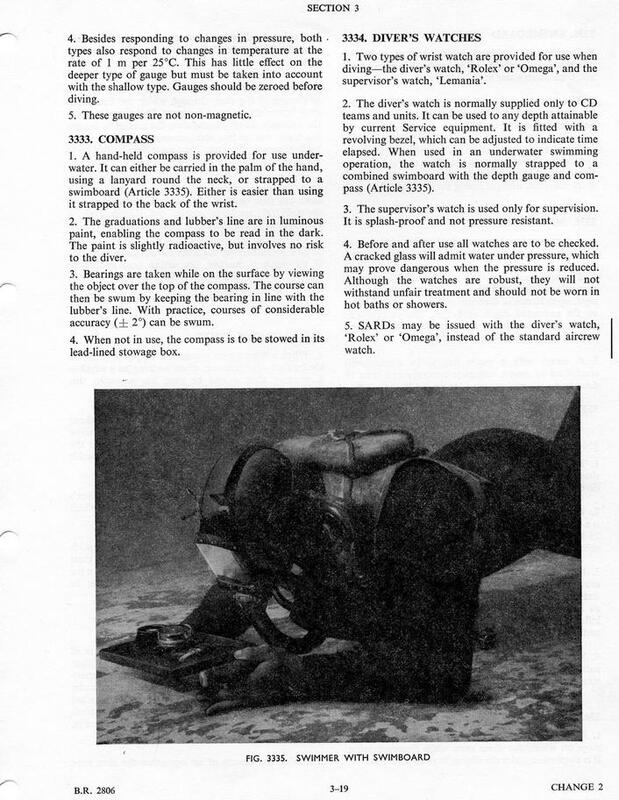 Another important factor is the presence of less metal during diving which involves the risk of magnetically-controlled mines. The Rolex milsubs were used by the British Special Forces, the SAS (Special Air Service) commandos and the SBS (Special Boat Service). The SAS/SBS are still considered the best trained forces in the world (read ‘Bravo Two Zero’ by Andy McNab for example). This means that these watches were taken on the most secret and dangerous missions in Northern-Ireland, the Falklands and Asia. And again Rolex proved to be capable of producing the most reliable watches that will never let bearers down. 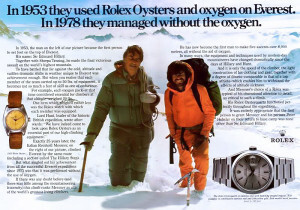 Although Rolex has always had their full focus on mechanical watches it would be wrong to think that quartz watches would have been an afterthought for Rolex. As early as the 1950s Rolex was busy with research about electronic timekeeping and in 1952 they received their first patent for a design of an electro-mechanic watch. 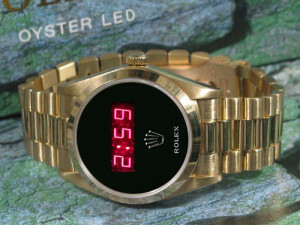 An interesting fact is that of the 50 patents Rolex issued between 1960 and 1990 21 were for electronic watches. The most extreme were the patents of Rolex in the seventies for digital (LED) watches. They even built one prototype with ref. 7065. 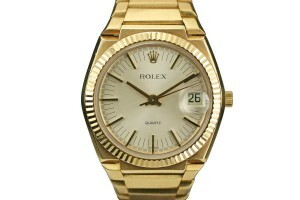 The first quartz watch that Rolex brought to the market was the Quartz Date 5100 in 1970. 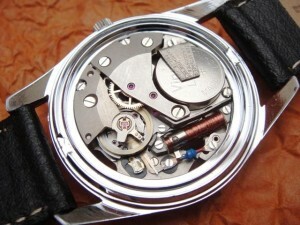 The watch had a Beta 21 movement which was also used by Omega and Enicar. 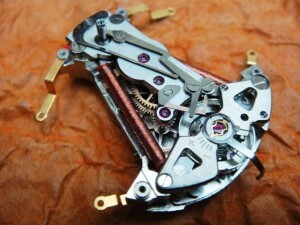 Total production was only 1.000 watches because Rolex wanted to produce their own movement as soon as possible. After 5 years of designing, developing and testing the first completely in-house made movements were presented in 1977, the 5035 and the 5055. These were housed in the ref. 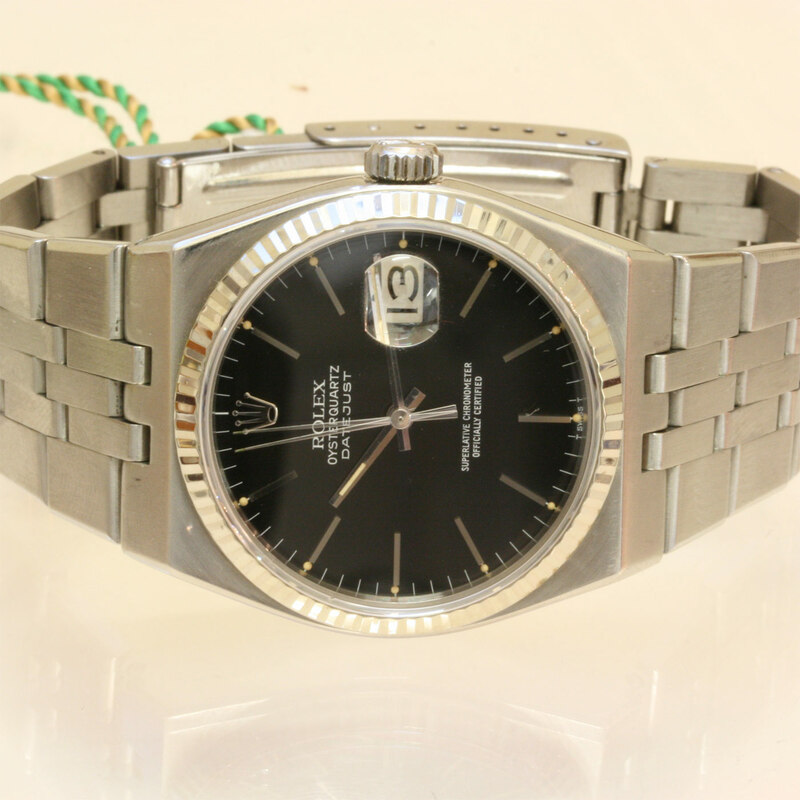 5035 Datejust and the ref. 5055 Day-Date. 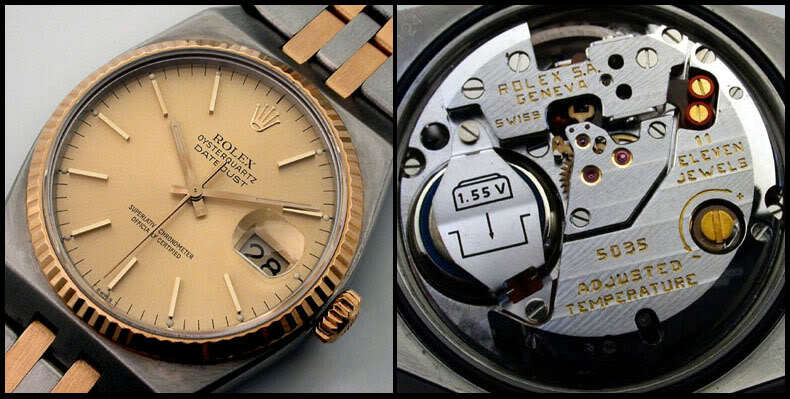 The 5035 and 5055 quartz modules made by Rolex were not only technologically the best one could get but also in terms of design and finish. The movements with 11 rubies used the latest CMOS (Complementary Metal-Oxide Semiconductor) coupling system, a 32 khz oscillator and analog thermocompensation. The standard of quality for the Oysterquartz that Rolex used was even higher than the standards for their mechanical watches. 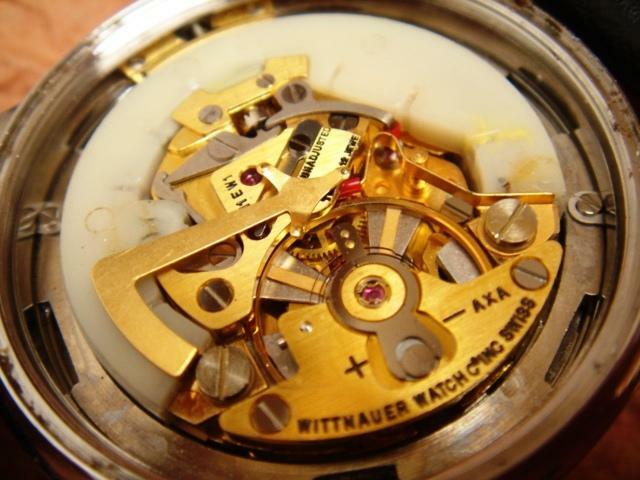 Also esthetically the quartz movement that Rolex made is at the very top of the market and it is even said that it is the most beautiful quartz movement ever made. According to the estimates their are just short of 25,000 Oysterquartz watches produced by Rolex. The final model was the ref. 17000 in steel in the year 2001 (although after 2001 not in the catalogue anymore you could buy them up to 2003). Variations were the ref. 17014 with a white gold bezel, the ref. 17013 in steel/gold and the ref. 17018, a Day-Date in gold. 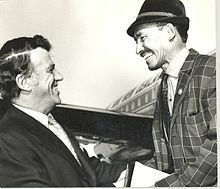 Edmund Hillary was born in Auckland (NZ) on 20 July 1919. His parents were Gertrude Hillary, born Clark, and Percival Augustus Hillary. In school Edmund was smaller than his peer group and he was a very shy boy taking refuge in his books and daydreaming about an adventurous life. He started boxing thanks to which he gained more confidence and he started growing. At the age of sixteen his interest in mounteneering was aroused during a school outing to Mount Ruapehu. Although 1.95 m and all lanky and leggy he discovered that he was physically stronger and had more stamina than his fellow climbers. Edmund studied maths and science at the University of Auckland and in 1939 he completed his first real climb when he reached the top of Mount Ollivier (in the Southern Alps). Together with his brother Rex he became a bee-keeper, a summer activity which allowed him to climb in winter. 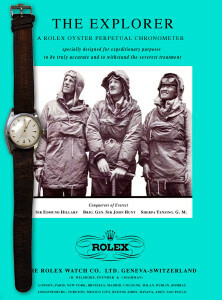 In the build-up to the climbing of the Mount Everest in 1953, Edmund participated in a number of other expeditions. 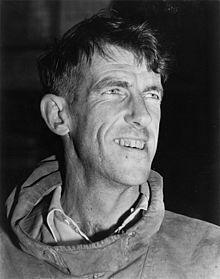 In 1948 he reached the southern ridge of Aoraki/Mount Cook, the highest peak of New-Zealand, together with Harry Ayres, Mick Sullivan and Ruth Adams. 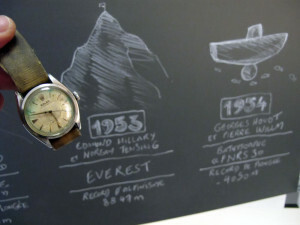 In 1951 Edmund took part in a British exploration of Everest led by Eric Shipton. In a team, also led by Shipton, Edmund and George Lowe tried to conquer Cho Oyu. When it became clear that it was impossible to do so from the Nepalese side, Edmund and Lowe crossed the Nup La to Tibet and reached the old Camp II, on the northern side where all of the pre-war expeditions had been. 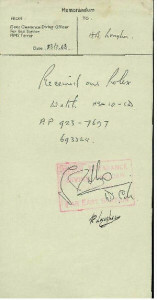 In 1952 Edmund and his friend George Lowe were invited by the Joint Himalayan Committee to join a British team and climb the Mount Everest the following year. Eric Shipton was the initial leader of the expedition, but he was replaced by Hunt. He composed 2 teams that were to reach the top. Team 1 included Tom Bourdillon and Charles Evans, team 2 Edmund and the sherpa Tenzing Norgay. 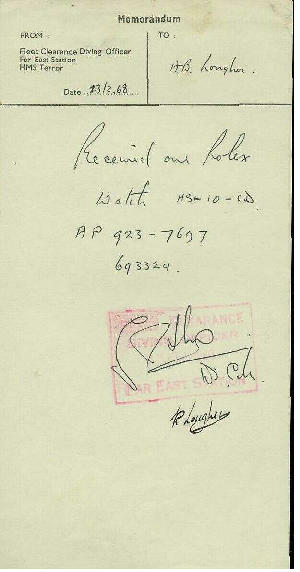 It was extremely important to Edmund and Tenzing to create a good-working friendship. The Hunt expedition consisted of over 400 people including bearers and 20 Sherpa guides. The luggage weighed approximately 10.000 lbs. Lowe supervised the preparations for climbing the Lhotse Face, a large and steep ice wall and Edmund thought of a route through the treacherous Khumbu Icefall. 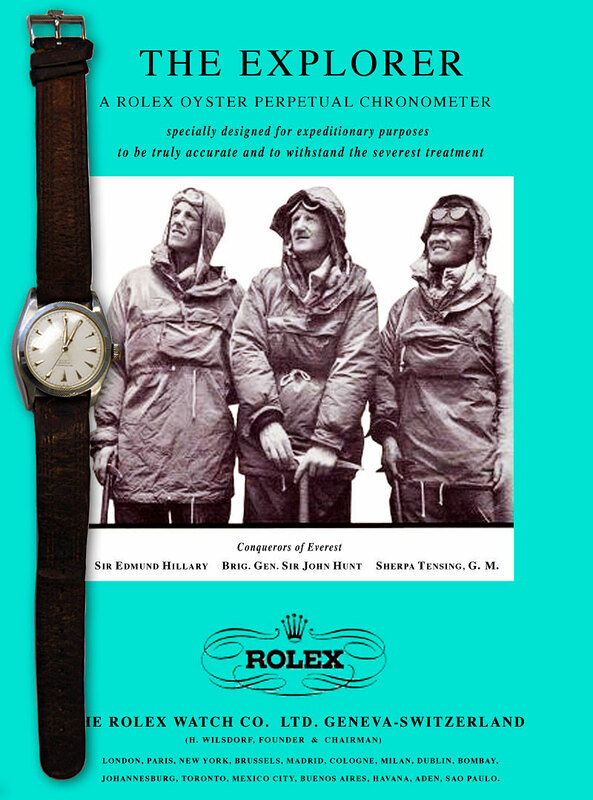 An indispensable part of Edmund’s equipment was the Rolex Oyster Explorer he was wearing around his wrist. In Edmund’s company, this watch reached the top of Mount Everest without a whimper. The base camp was pitched in March, 1953. 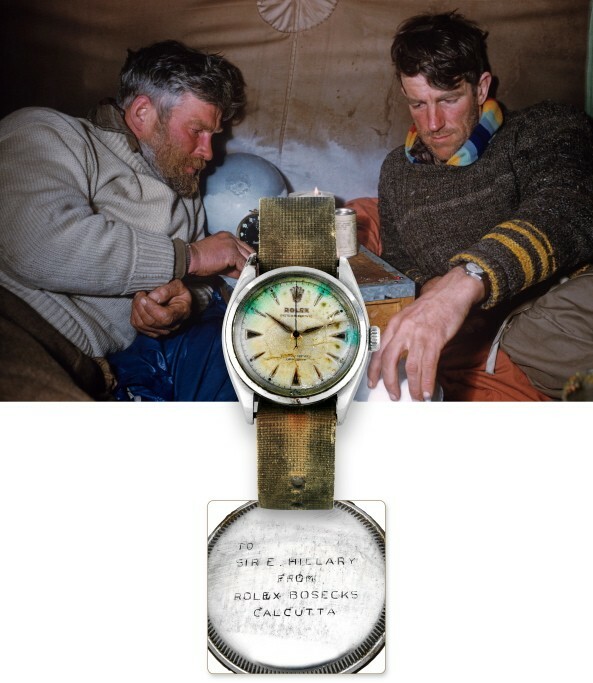 Slowly they climbed further towards the final camp on South Col at a height of 7,890 m. On 26 May, Bourdillon and Evans tried to reach the top, but they were forced to return, because Evans’ oxygen system failed. Eventually, the couple had reached the South Summit, being only 91 m below the top. Subsequently, it was Edmund’s and Tenzing’s turn to try to reach the top. Severe snow storms and wind caused the duo to be stuck on the South Col for two days. On 28 May, they set off supported by the Lowe, Alfred Gregory and Ang Nyima trio. That same day Edmund and Tenzing pitched their tents at a height of 8,500 m while the supporting team descended. The next morning Edmund learned that his boots outside the tent were entirely frozen. It took him 2 full hours to defrost them, but then he and Tenzing were able to start their final climb to the top. They were packed up with 40 kilo weighted rucksacks. The crucial climbing phase was the conquering of a 12 meter high cliff (later called the Hillary Step). Stuck between the cliff and surrounding ice Edmund managed to work his way up through this crack, followed by Tenzing. From there it was relatively simple to reach the top. In the story he wrote later, ‘The Dream Comes True’ Tenzing argues that Edmund was the first to reach the top, but according to Edmund they jointly did so. They conquered the top of Mount Everest, the highest point on earth (8,848 m), at 11.30 a.m. As Hillary said: ‘A few more whacks of the ice axe in the firm snow, and we stood on top’. They stayed on top for only some fifteen minutes. There Edmund took the famous picture of Tenzing carrying his ice axe, but because Tenzing never took pictures, there are none of Edmund on top. However, in Tenzing’s autobiography ‘Man of Everest’ he says that he offered to take pictures of Edmund, but the latter would not allow him (‘I motioned to Hillary that I would now take his picture. But for some reason he shook his head; he did not want it’). Tenzing left chocolats in the snow as some sacrifice and Edmund placed a cross he had received from John Hunt. Additional pictures were made to produce conclusive evidence that they had actually reached the top of Mount Everest. The descent was rather tough because the snow had covered their tracks, so it was difficult for them to discover their earlier footsteps. 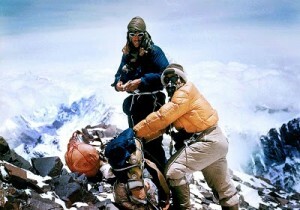 The first person to congratulate Edmund and Tenzing was Lowe who had climbed up carrying hot soup to welcome them. The news about the successful expedition reached Engeland on Queen Elizabeth II’s coronation day and the press called this a coronation gift. By way of thanks for this 37 people of the team were awarded with the Queen Elizabeth II coronation medal, MOUNT EVEREST EXPEDITION being engraved on the rim. Edmund and Hunt were knighted by the young queen and Tenzing was awarded by the British Empire as well.